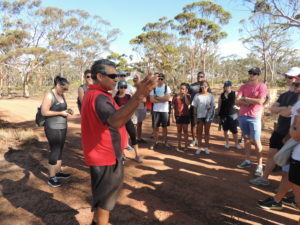 Join Njaki Njaki Traditional Owner and Aboriginal tour guide Mick and undertake a cultural walking tour of Merredin Peak and the surrounding reserve. Learn about the rich Aboriginal history via a walk along the trail up the rock and be rewarded with delightful views of the town and reserve land to the East. Learn about the Njaki Njaki peoples creator that shaped the landscape we now see today through the Moulyk Dreaming Tour. We can provide tailor made tours on request.